Back when Tasia released the Granville Shirt, I snatched it up immediately. 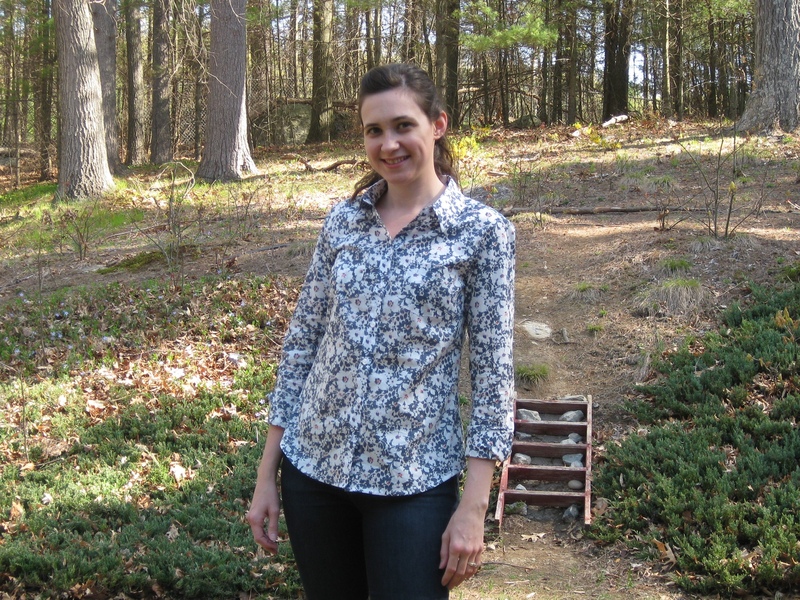 It is so rare to find a women’s shirt pattern with all the proper shirt details that I had to put my money where my mouth is, and buy it. It has a proper two piece collar, back yoke, and tower placket for the cuff. Basically everything you’d expect from a RTW shirt. I really loved the version Tasia did in Liberty lawn (I need that print in my life!! ), so it inspired me to finally dig out my own Liberty fabric I bought a year ago. I picked up this fabric last year when fabric.com had a sale on their Liberty fabrics. That brought it down to under $30/yd… still pretty rich for my budget, but I needed to see what the fuss was about. Thankfully I was not disappointed—this fabric is definitely worth the splurge. It presses perfectly, sews easily, heck it even cut easily. Once I had it in my hands, I just couldn’t figure out what to do with it. It’s far more sheer that I had anticipated, which meant it would have to be underlined for a dress. Buuuut I didn’t want to make anything fancy; I wanted something I could wear just whenever. I didn’t spend $60 on fabric for it to hang out in my closet, ya know? So when the Granville came along, I knew it was a perfect match. 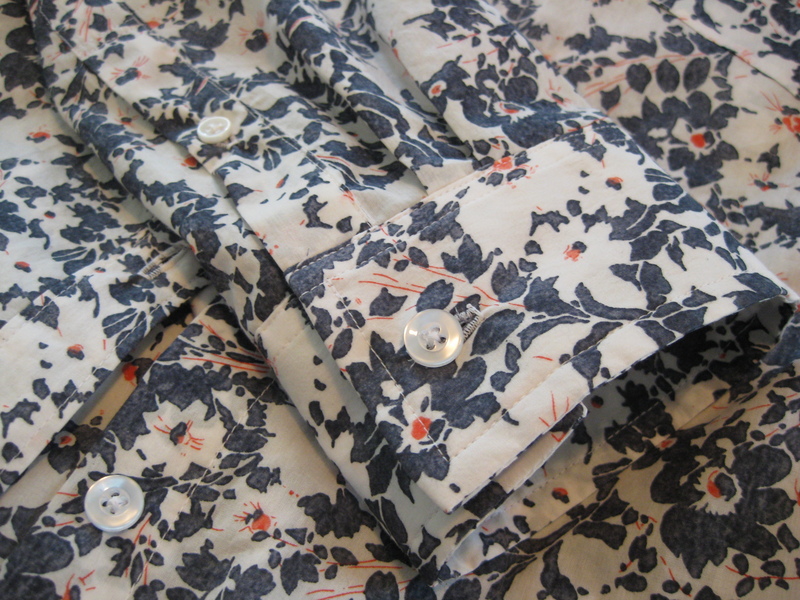 I love button ups, and the fabric weight and crispness is ideal. Since I was using expensive fabric, I made up a muslin to check the fit. Thank goodness I did, because it took quite a bit of work to get it right. Now, almost all the shaping for the pear figure is at the side seams. Even though I would classify myself as a pear shape, I’m more “junk in the trunk” than full hipped, and my “nipped waist” is long gone. To accommodate all that, I graded out at the side seam, but nipped in at the back princess seams. Then I brought the hip in at the side seam, and let out the same amount on the back seams. Basically I needed to transfer much of the side seam shaping to the back. I was still getting a little pooling in the lower back, so I straightened out the curve at the top of the back piece where it meets the yoke. That reduced the CB length slightly and helped everything to lay nicer. I also did a petite adjustment above the bust to hike up the bust dart and shorten the armhole depth. Things were starting to shape up once I got my personal fit adjustments taken care of. However, I ran into a lot of trouble with the sleeve and shoulder. I don’t really think I have narrow shoulders, but the shoulder seam was completely falling off, so I brought it in by 1/2″. Now the sleeve. I have to say, I was not pleased with the shape of the sleeve. The sleeve cap is nearly symmetrical, which leads to a very restrictive fit (unless you have super erect posture, perhaps), and the sleeves are very narrow. I did a quick comparison to the Grainline Archer sleeve to see where I needed to go with it. I ended up bringing the curve of the sleeve cap out by about 3/8″ on the back side, and blended it into the bottom of the armhole, and up at the top of the sleeve cap (basically like Sunni did here, except that I didn’t add anything to the back armhole). Then I widened the sleeves by 1″ (1/2″ on each side) and pleated out the excess at the cuff. A couple other notes… The sleeves are very long on this pattern! The only sleeve length I removed was 3/8″ when I did the petite adjustment, but keep in mind I’m always adding at least 1″ to most patterns, and RTW is ALWAYS too short in the sleeves. I made my tower placket 1/2″ longer in case I had to shorten the sleeves, but I was happy with the length. Then on the collar, I’ve seen a few people comment that the collar stand didn’t fit the neck opening. I had no issues here, though I would say that having a 5/8″ SA at the neckline does no one favors. Overall, I am super pleased with the pattern. It’s clear that Tasia put a lot of thought into having excellent shirtmaking instructions—you won’t find directions better than these in any pattern out there. However, I feel like I have to put a disclaimer to watch out for the sleeves. I know a lot of people go weak in the knees when it comes to making armhole/sleeve cap adjustments—it certainly isn’t intuitive how to adjust this area. I actually put my original muslin aside for a solid month or more before going back in to figure it out. Admittedly, the petite adjustment I did (to shorten the armhole depth and raise the bust dart) went a long way in improving the fit, but that was only part of the issue. Having so little ease in the sleeves, and having a near-symmetrical sleeve cap is just problematic in my opinion. Okay, last thing… I’ve been asked a few times on IG about how the Granville compares to the Grainline Archer, but really we’re talking apples and oranges here. The Granville is fitted and shaped, whereas the Archer is loose and oversized. Personally, I have use for both patterns in my life; no need to choose one over the other. But, if the Archer just doesn’t have the shaping you want, the Granville is an excellent choice. I love that it is shaped without being tight or uncomfortable, so it will still work as an every day shirt. Anyways, I’ll be using both patterns for sure! One question about the sleeve width, does this allow you to roll the sleeves up easily? I find my sleeves are too tight to roll up comfortably and am considering adding width like you did but I want to avoid the “billowy” look. Thank you! And yes, the sleeves roll up easily with the extra width–a must for any button up shirt as far as I’m concerned! Lovely shirt. And yes, Liberty tana lawn is worth the money, every time. I love your Granville. Thanks for posting about all the tweaks and fitting adjustments you made. Now you’re ready to sew up a lot more! Love that fabric. But that sounds like a lot of alterations! Nice job, shirt looks beautiful. What a lovely shirt! Apart from the sleeve length I found it fit me pretty much out of the packet. I can see the benefit of a little more ease in the sleeve cap though. Thank you! Nice that the pattern worked for you out of the envelope. For me the sleeves were uncomfortably restrictive, so I’m glad I was able to work out the fit. 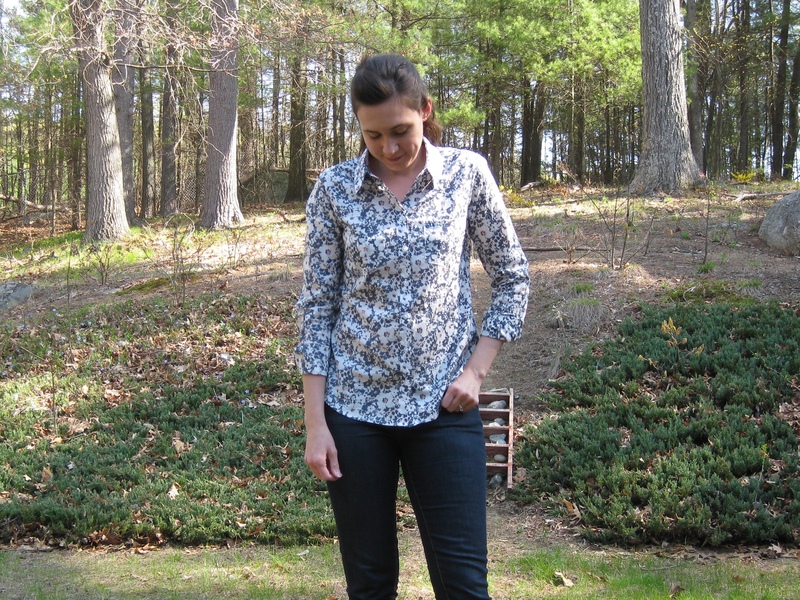 This looks awesome Lisa – and you really nailed the fit! 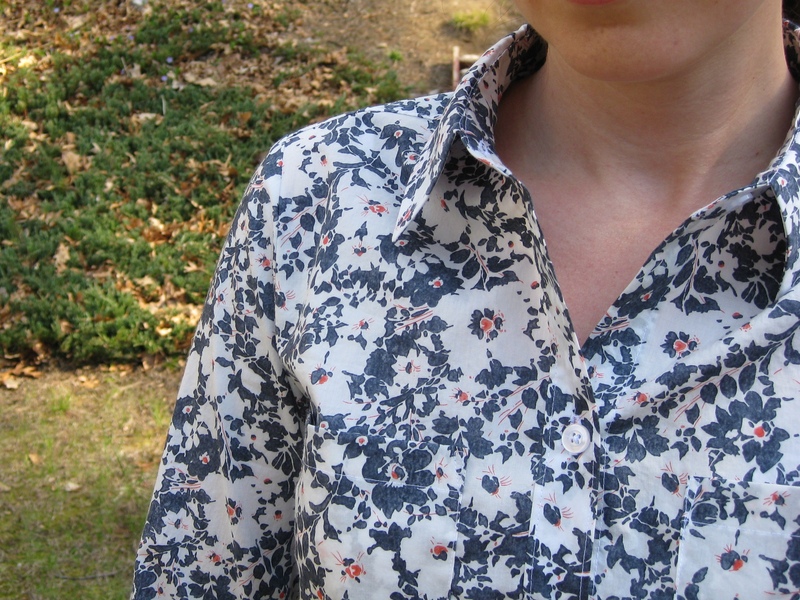 I agree, there is nothing nicer than Liberty Lawn, and it really makes a lovely shirt. How nice to make a garment with it, that you will reach for again and again! Thanks for the comparison – I snapped the Granville pattern up right away because I love all the details too, but I haven’t tried it yet because I know there will be a lot of fitting work to be done. Thanks, Heather! The Liberty is just divine… Hope you get around to trying the Granville! Thank you! And nice to know it’s not just me being whiney about the fit. 😉 Definitely worth the effort though, it’s such a nice pattern! Thank you! This one was worth fiddling with until I was happy. It looks really good! The fit really appeals to me and I love the print you used. Is there a good source for the petite adjustment you mentioned? I nearly ruined an Elizalex trying to fix some fitting in that area. Thank you! I do love the slim fit of the shirt, can’t wait to add a few more to my wardrobe. I don’t recall a fitting source… I just draw a horizontal line about halfway up the armhole, cut the pattern piece, then overlap by however much I need to take out, then just blend the lines. Then I do the same on the sleeve. I have this pattern waiting to be muslined and I’m so glad to have this post to refer to when I get to it. I will probably have similar sleeve issues– my arms were not made for a slim fitting sleeve. I have some Liberty lawn in my stash that I want to use for this pattern. I hope mine turns out as well as yours. It really looks great! Definitely muslin first! Since it is a fitted shirt, anything that’s off is so much more obvious. I’m sure you’ll love it though, can’t wait to see your version! It looks great. Gorgeous fabric! I’m looking forward to making my second version- I didn’t have the sleeve issues but it just goes to show how unique our bods all are! That fabric was waiting for this pattern – gorgeous. So crisp and professional, looks super. I think you’re right… glad I held on to it for the right pattern. Thank you! This is so lovely! You did a great job with the fit! Now you can bang out as many shirts as you need with your perfect pattern! I’ve never done any true garment sewing with Liberty, although I did buy a little once to sew a quick scarf for my mom. It’s so soft and nice! Thank you! Soooo worth taking my time to get the fit right. I’ve only ever sewn with liberty once. I found a handmade dress from tana lawn and cut it up to make a blouse. And Ive dreamed about buying liberty ever since! Haven’t hit the purchase button yet, but always tempted. It’s so nice. You are such an awesome shirt maker. I am tempted by the Granville pattern as well. Thank you, Liza! I know the Liberty is pricey, but at least it’s worth the price. Hope you get to splurge on it sometime! Thanks for another thorough and helpful pattern review! Your shirt is just gorgeous. I especially love the close-up pic of your cuff – don’t know how I missed that on IG. Your stitching is perfect. I got kind of sloppy on my recent Archer because I was just so ready to be done with it. Your impeccable work is a reminder to take as much time as needed. It was soooo hard to keep focused and do a good job stitching—my time is really limited these days and it’s tempting to just plow through! But thank you, It’s always nice to know my reviews are helpful! Your shirt turned out lovely. All your work paid off. I have the Oakridge, but haven’t made it yet. I am looking for just the right fabric! Thank you! I’m so pleased with the outcome. i’m always impressed by your fitting abilities! thanks for the informative post and way to use “the good stuff” on it, fabric-wise. i bet it’s a dream to wear. Not that I’m glad you had fitting issues, but it does make me feel better that I’m not just being a crazy person! 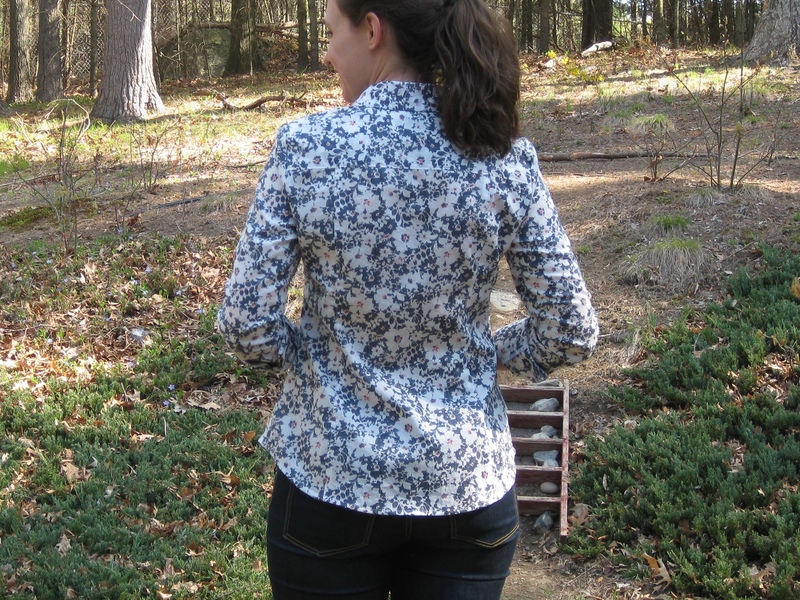 It’s worth perfecting the fit on a shirt like this, I hope to make many more! Thank you! Clearly one size fits all does not work for sleeves! I don’t think I had a proper length sleeve until I made one myself… So annoying to be on either end of the spectrum!